What a beautiful, feminine fragrance! It smells like mounds of soft,sweet whipped cream with a lovely warmth to it! It is soft and delicate, not gooey sweet, but sensual and softly warm. This is a gorgoeus scent, and would be a lovely Mother's Day gift, especially if your mom, aunt, or whoever likes soft, feminine scents. This to me is a perfect cross-blend of fruit and sweet vanilla-y creaminess. I have even tried it with a dab of a flower-note scent (like Garden Gate or Honeysuckle Green Tea) and it gives it just a little twist if I'm feeling like having a little green mixed in. The sweetness is tempered nicely by the hint of juicy fruit, though it's not "PEACH!!" in your face. Not really peaches and cream - more sophisticated than that. And as it dries down it does not become cloyingly sweet, just ... pleasant. This is my new favorite obsession along with Lavender Vanilla, Sinopia and Halloween Night (the ultimate for candy lovers!). The first word that comes to my mind is silky. It's not the peach I've experienced in other perfumes that is vibrantly fruity and juicy, this is more like a creamy dessert. This may sound crazy, but I love layering it with Vanilla Pipe Tobacco, which gives it a lot of richness and depth. I got my sample pack and I immediately had to try Chiffon, Garden Gate, and this. I was expecting to totally fall in love with Chiffon and like this, and instead I fell in love with this. Surprisingly (I say, based on other reviews), the citrus amps on my skin with this one and the peach provides the softer base. It is just about edible! It's a soft warm vanilla rounded out by a soft citrus and held up by a faint faint peach (more like peach skin than peach juice). Lovely! Chantilly Cream and Chiffon both broke my heart with the spring update. I was so sure that I'd love both of them, but neither are working out. I love almost all of Solstice Scents' vanilla and marshmallow blends, but Chantilly Cream winds up smelling more fruity than vanilla-y on me. And I normally love citrus and peach, but the fruit notes in this smell strangely dry, powdery and tart, like conversation heart candies or sweet tarts candies. 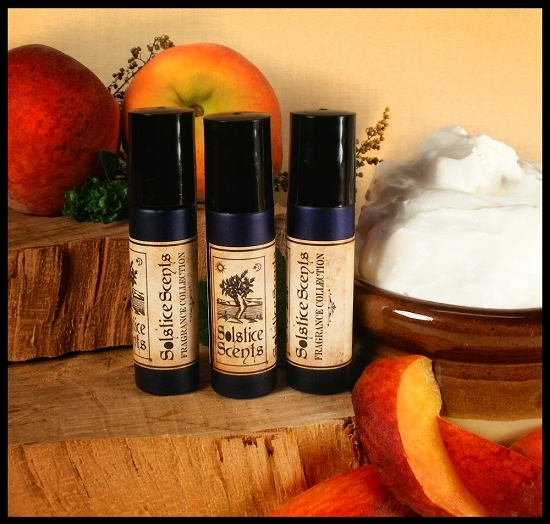 I've noticed that the peach goes a bit plasticy on my skin at first (which I get from some other peach blends, like bpal's Belle Vinu or some of Haunt's peach scents). I really like more of a juicy, syrupy sweet peach, and this is more clean smelling, translating to a plastic scent on me. I received a sample of Chantilly Cream perfume last Saturday, and it is absolutely beautiful. What a lovely surprise! I expected that I wouldn't like this because it sounds "girly" to me, and I love the fragrances that are dark and bold, that have traces of resin and incense. So, when I applied Chantilly Cream I was floored. It is beautiful, well rounded, perfect. In fact, I think that debibob said it best--read her review 'cause it's perfect! This sublime little scent is a "gotta have" for me! I broke out Chantilly Cream today because I wanted to encourage Spring to finally arrive where I live! On me, it is a sweet, well-rounded peach scent - not candylike and not aggressively citrusy. I get the creamy notes in the background - the "cream" part is not marshmallow-y on me at all and it's not like the other generically "sweet" supporting notes that some other etailers use in their blends. Chantilly Cream is lovely and feminine and I do agree with Angela that it's a good scent to wear to work. It's not aggressively present, but it also lasts surprisingly long on me. I absolutely LOVE Chantilly Cream! This scent is so light and feminine. Reminds me of a garden/patio party (an intimate one) with close friends and family. Then things get serious when peach cobbler gets to the table. From the vial, it smells like peaches and cream. Reminds me of peach parfait/peach cobbler. On the skin, the same scent but vanilla hugs close and surrounds me with love lol. Chantilly Cream is light but I assume if you layer it with glace (must get soon), it'll be more noticeable. The peach note is dominant and is ripe, sweet, and juicy. The cream is going plastic on my skin. after a bit the cream goes away and it's just delicious syrupy peaches with a bit of the gone wonky on my skin cream in the background. In the vial: thick peach syrup. I can even smell peach skins, yum! I dabbed a bit on my skin and it develops a slight menthol edge that briefly makes this more like peach cough drop, but the sharpness fades as it dries so it's just peach hard candy. In fact, its sweetness intensifies as time passes - a feature of the perfume, not a bug, according to SS. It is not unpleasant, but I was hoping the cream and mandarin would come through more. Chantilly Cream is sweet, fruity, and creamy. I get mainly peaches and a touch of zesty mandarin – just a tiny bit. It doesn’t smell orangey at all, really, there’s just that slight tartness. The vanilla is creamy, more like a french vanilla than vanilla extract. It’s not boozy or sharp at all. The whole shebang smells delicious and edible yet light, like a bowl of ripe peaches topped with rich vanilla bean-flecked ice cream and just a dollop of airy whipped cream. It's really good. Ohhh Chantilly Cream. I love you so much. I'm so sorry that last year I thought you were too sweet and had bubblegum like notes; I've seen the error of my ways, and I'll never take you for granted ever again! Peaches and vanilla cream, and as time goes on the peach eventually fades leaving behind the lite, warm vanilla cream. This one's as good as it gets!